Robbie Maddison is an Australian stunt rider, known as today’s Evel Knievel, who is famous for numerous record-breaking stunts including World’s longest motorcycle jump, World’s highest motorcycle jump, backflip jumping the open Tower Bridge in London, Corinth Canal jump in Greece, jumping down a ski ramp in Utah Olympic Park, riding a motorcycle on water, just to name a few. Robbie grew up in Kiama Downs, in New South Wales, Australia. He started his career competing in national motocross and supercross events, but developed a passion for freestyle motocross (FMX) and entered his first FMX event in Bachus Marsh, Victoria, and ended up winning both the amateur and pro event. 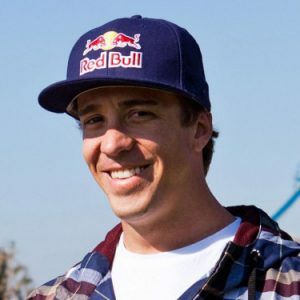 In 2004 he won Gold at the X Games at Australia’s Wonderland completing 13 backflips. In 2005 he broke two world records. He has since gone on to be regarded as one of the best FMX riders of all time. Robbie holds the world record for the longest motorcycle jump. On March 29, 2008, in Melbourne Australia during a Crusty Demons ‘Night Of World Records’ show, he jumped 316 feet (96.32m) on his first attempt. On his second attempt, he jumped 342 feet (104.24m) but landed hard on his back wheel. Not happy with that, he tried again and jumped 351 feet (106.98m) for a perfect landing. Robbie teamed up with Skullcandy and Red Bull Media House’s On Any Sunday to record a video called ‘Drop In’. 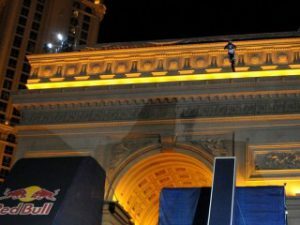 On January 1, 2009, live on ESPN, Robbie jumped his Yamaha YZ250 96 feet up onto the top of the Arc de Triomphe replica in front of Paris Las Vegas. He then dropped 80 feet back down to land safely on a ramp at ground level. He didn’t walk away from it completely unharmed. He tore the flesh between his thumb and forefinger on landing from the freefall, requiring 10 stitches. 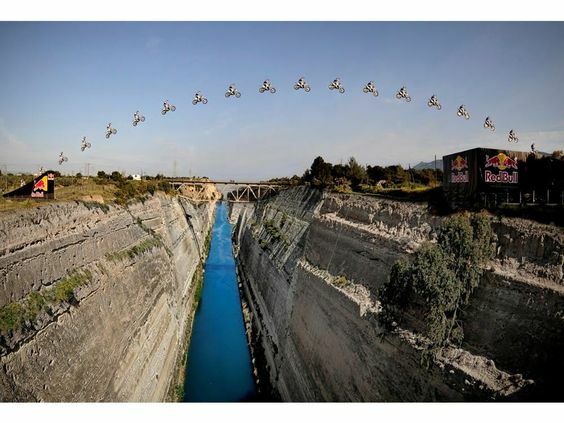 On April 7, 2010, he jumped his bike more than 80m (278 feet) over the Corinth Canal in Greece. He needed a takeoff speed of 120 km/h to achieve it. 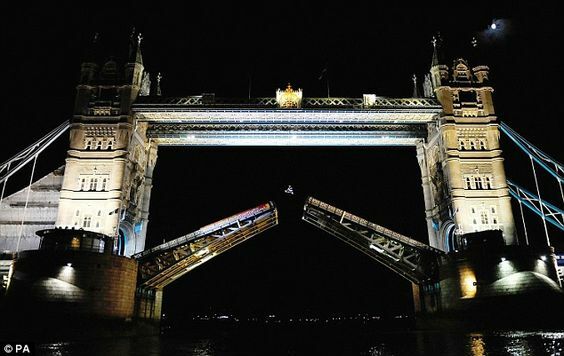 On July 2009 Robbie jumped the Tower Bridge in London whilst the bridge was raised, throwing in a backflip for good measure. With a potential fall of 200 feet to the water below, it was a jump not to be scoffed at. The stunt was three years in the making. There are plans underway for a Pipe Dream 2, which he plans to film as soon as there’s a monster swell off the coast of Mexico. 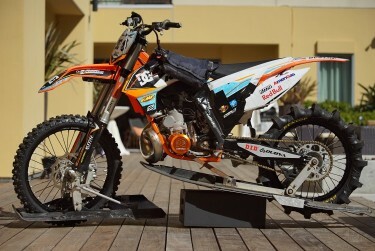 Robbie Maddison’s water bike. The bike has been fitted with water skis to each wheel, and a hill climbing tire on the rear wheel. “It works exactly like the wheel of a paddle steamer,” says Robbie. 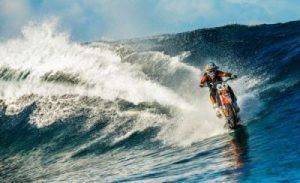 I can’t wait to see what Robbie Maddison will come up with next. Be sure to keep a lookout for updates to this post. I like very much this sports and I want to fly as they fly or jump for just five meters long but it would be impossible for me. But I enjoy watching this kind. I am curious about what benefit these people are into. Are they receiving prizes like other sports especially boxing. I ask the question because it’s so risky to do it. Thanks for your thoughts. I’m not sure how he would earn his income, probably sponsorship from companies like Red Bull, and maybe TV coverage. He also has his own range of gloves on his website. There is also his children’s book ‘The Story of Robbie Maddison.’ It really takes a special type of guy to do what he does.